Diesel fuel represents a permanent source of soil pollution, and its removal is a key factor for human health. To address the limitations of conventional remediation techniques, microwave (MW) heating could be employed due to its great potentiality. This work presents the lab-scale experiments performed to study the potential of MW processing for diesel-polluted soils treatment and related modeling for the optimization of MW systems operating conditions. A sandy soil was artificially contaminated with diesel fuel, moisturized with different amounts of water content, and thermally treated by MW radiation using a lab-scale apparatus to investigate the effect of soil moisture on soil temperature profiles and contaminant removal kinetics. An operating power, ranging from 100 to 1,000 W, and treatment times of 5, 10, 18, 30, and 60 min were investigated. Contaminant residual concentration values were fitted using the first order kinetic model, and desorption parameters were calculated for each soil at different operating powers. Main results show that the operating power applied significantly influences the contaminant removal kinetics, and the moisture content in soil has a major effect on the final temperature reachable during MW heating. Minimal contaminant concentrations were achievable by applying powers higher than 600 W for a treatment time longer than 60 min. For remediation times shorter than 10 min, which result in a soil temperature of about 100 °C, the effect of the distillation process increases the contaminant removal, whereas for longer times, soil temperature is the main key factor in the remedial treatment. MW thermal desorption of diesel-polluted soil was shown to be governed by pseudo-first-order kinetics, and it could be a better choice for remediation of diesel-polluted soils, compared to several biological, chemical–physical, or conventional thermal treatments, due to its excellent removal efficiency. 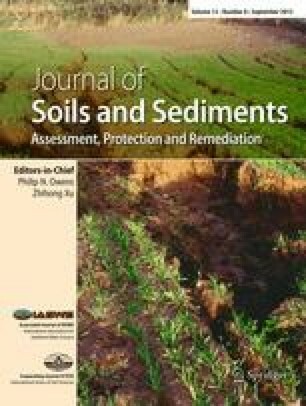 The results obtained are of scientific and practical interest and represent a suitable tool to optimize the treatment operating conditions and to guide the design and the scale-up of MW treatments for full-scale remediation activities of diesel-polluted soils. This research was funded by the Italian Ministry of Education, University and Research (MIUR), and “Research Program of Relevant National Interest” (conventional and novel remediation thermal desorption treatments of hydrocarbons polluted soil).